For many years, cafeteria food has inherited a bad rap for its unhealthy food selections. This is one of the reasons why obesity is on the rise and why Michelle Obama started her reform to improve America’s “bad” eating habits. So is it working? Are students actually eating the healthier lunches at school? Or is the rumor that garbage cans are filling up with nutritious foods while kids are not, true? Kids have a lot of control over what they are eating for lunch at school. With that said, how do we get kids to choose the healthier options and not just toss them? I liked the statement, “Healthy eating is not the same as eating less”. Healthy eating is about eating a balanced diet of the “right foods”. 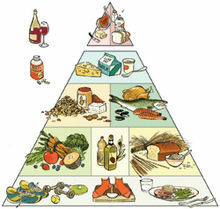 Take a look at The Healthy Eating Pyramid? This should be your guide when you encourage your kids to eat healthily. If you follow these 5 tips your kids will be on the right track towards making those healthier selections in the school cafeteria. Talk with your kids about healthy eating. 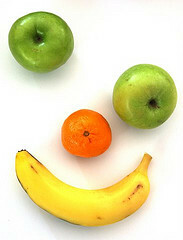 Together, view with your children the FSA website that explains healthy eating. Encourage your kids to eat healthily at school. Explain why healthy eating is important to their bodies. While eating fattening foods might be tasty, it will most likely make him tired later in the day, draining his energy. Tiredness induces an inability to focus on school work as well as after-school activities. It takes us eleven times of trying a particular food before we really know if we like it or not. You never know, you might grow to like it in the future so keep trying it. If you eat healthily, your kids will follow your lead. Let your children see that you are eating healthily so they will learn your healthy habits. Your kids will feel more involved if they are a part of the planning and cooking. Prepare lunch together. You can talk about healthy eating as you cook. Talk with your administrator about inviting speakers to talk about the dangers of a poor diet. Showing what it’s like to live with type 2 diabetes and heart disease is a good forewarning of what’s to come with an improper diet. To answer the question, are garbage cans filling with nutritious foods? Kids are most likely dumping some of their “good” food in the trash, however, staying vigilant should help them on their path to a healthier lifestyle and they might just keep the junk in the garbage can and the nutritious foods in their bellies.